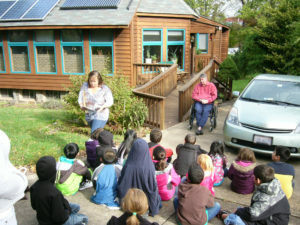 Solar homeowners shows off their solar home and electric vehicle to an interested audience. ASES is the nation’s leading association of renewable energy professionals and advocates. It has regional chapters in 41 states and the District of Columbia. It publishes the award-winning SOLAR TODAY magazine, and the e-newsletter Solar@Work for renewable energy professionals. It also hosts the ASES National Solar Conference, which will take place in August in Boulder, Colorado. Solar United Neighbors helps people go solar, join together, and fight for their energy rights. It helps thousands of people go solar every year through bulk purchases known as “solar co-ops” as well as through a paid membership programs. Members receive on-going support for their solar system, discounts to businesses that have solar, and join a community of solar supporters to ensure their investment in solar is protected.